As most industry eyes and ears were fixed on Minister Radebe’s process to conclude the 27 Renewable Energy Power Purchase Agreements, ENERTRAG SA (ESA)and Genesis Eco-Energy Developments (GEED) concluded one of the largest renewable energy development agreements since the launch of the Renewable Energy Independent Power Purchase Procurement Programme (REIPPPP) in 2009. 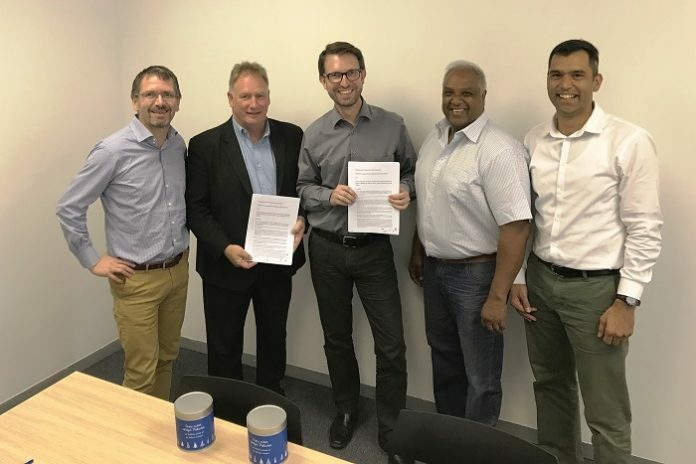 ESA, the newly formed local subsidiary of German-based ENERTRAG AG and Genesis Eco-Energy Developments,one of South Africa’s most successful pioneering renewable energy project developers and investors concluded an agreement to develop 1 800 MW of wind energy projects in South Africa. The deal catalyses a portfolio of wind energy projects strategically, some in advanced development stages,located across the country and was brokered by ESA directors Zuben Jessa,Dr. Tobias Bischof-Niemz, ENERTRAG AG’s CFO Dr. Gunar Hering, and GEED partners Davin Chown and Ralph Damonse. Genesis is a wholly black owned South African renewable energy company that has contributed to the development of 520 MW of operational wind and solar PV projects and has a development pipeline of 2 700 MW of projects in South and Sub-Saharan Africa. ENERTRAG is a privately-owned, diversified renewable-energy business focused on developing, owning and operating generation plants, storage systems and grid infrastructure.Started in 1992, ENERTRAG is characterized by its strong commitment to local development partnerships and co-ownership of projects by local communities. Its headquarters is situated in rural Germany, 120 km north of Berlin. This partnership brings together two companies with longstanding development track-records, and a commitment to efficient clean energy development.The South African renewable energy market stands to gain significant added benefit from the combined wealth of development experience from GEED with the project development capabilities and technical expertise of ENERTRAG. Commenting on the partnership, Zuben Jessa, country manager for ESA stated “The conclusion of the PPAs have provided much needed relief and optimism in the industry. We are confident that, purely based on their superior economics, renewables will play a significant role in South Africa’s energy mix into the future. Moreover, renewable energy will enable transformation and provide employment in an exciting and modernized energy sector”. “South Africa has the opportunity to leverage its considerable renewable energy and human potential by capitalizing on the inevitable global energy transition. Stated Genesis’ Ralph Damonse: Demanding development that priorities industrialization, transformation and local participation will generate a transformed industry that is globally competitive,with far-reaching sustained economic benefits for South Africa and for local communities. The ENERTRAG-GEED partnership fits perfectly into this vision”. Genesis Eco-Energy Developments (genesis-eco.com) is a successful South African renewable energy company started in 2001. Genesis’ focus is on developing, owning and operating solar PV, wind, bio-energy and marine based projects. Genesis develops large scale projects as well as smaller scale project for commercial and industrial off-take purposes. ENERGTRAG SA (enertragsa.co.za / www.enertrag.com) is a diversified family owned German renewable energy development and operations company with significant expertise in project development, plant operations, and grid management and operations across Europe.